The small country of Belize on the Caribbean coast of Central America is home to the Belize Barrier Reef, the world’s second largest barrier reef after the Great Barrier Reef. We are working with partners in Belize to share successes and promote reef stewardship in this wider, global reef community. The Toledo Institute for Development and Environment (TIDE) is one of the leading conservation NGOs in Belize. TIDE works in partnership with the Government of Belize to co-manage the Port Honduras Marine Reserve and two terrestrial protected areas in the south of the country, in an area known as the Maya Mountain Marine Corridor, close to the border with Guatemala. 1. Community involvement in environmental stewardship. 2. Integrated land and seascape management from “ridge to reef”. TIDE is engaging local stakeholders – fishers, indigenous community groups, farmers, logging concessionaires, tour guides and school children – in stewardship through a number of innovative programs. One of our favourites is the Freshwater Cup environmental soccer competition. To participate in the annual soccer tournament, each school team must first complete an environmental project to protect freshwater resources – cleaning up local creeks, reforesting riverbanks, starting recycling schemes and more. Everyone in Belize loves soccer. Capitalizing on this passion is one way that TIDE rallies communities to care for the environment, promoting healthy people and a healthy planet. Freshwater Cup 2012 environmental soccer competition hosted by TIDE. TIDe trains and employs local youths to SCUBA dive and carry out environmental monitoring. 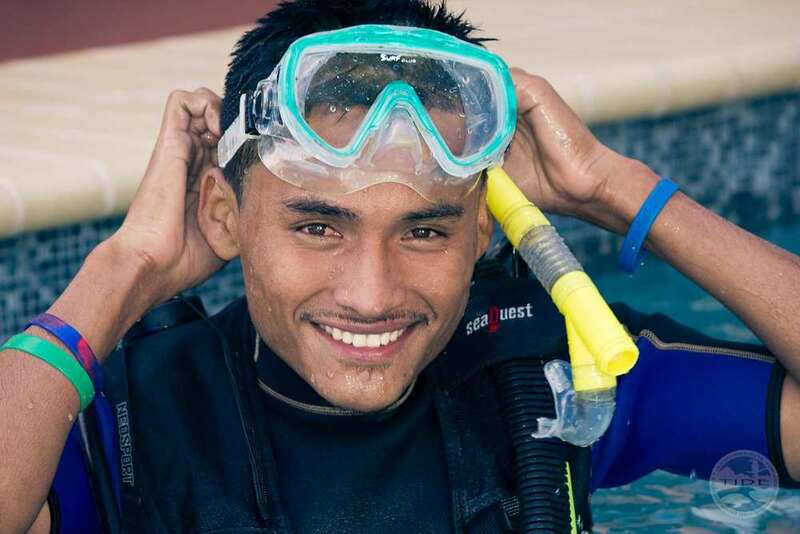 · Community researchers – TIDE trains and employs local youths to SCUBA dive and carry out environmental monitoring, providing the data they need for park management and nurturing young conservationists at the same time. · “Youth Conservation Competition” – high school students compete for university scholarships by giving theatrical performances that celebrate Belize’s natural treasures and raise awareness. · Community stewards – local fishers who express a desire to protect the seas are trained in marine ecology, organizational and leadership skills, plus practical skills such as engine maintenance. They then conduct outreach with other fishers, promoting ways look after fisheries resources and ecosystems. · Managed Access – the Port Honduras Marine Reserve was one of the first two MPAs in the Caribbean to introduce Managed Access fisheries management. Access to fish in the reserve is now for traditional users only, selected by a community-led committee. This is reducing fishing pressure and giving traditional users ownership of the MPA. Community researcher monitors coral in Port Honduras Marine Reserve 2013. 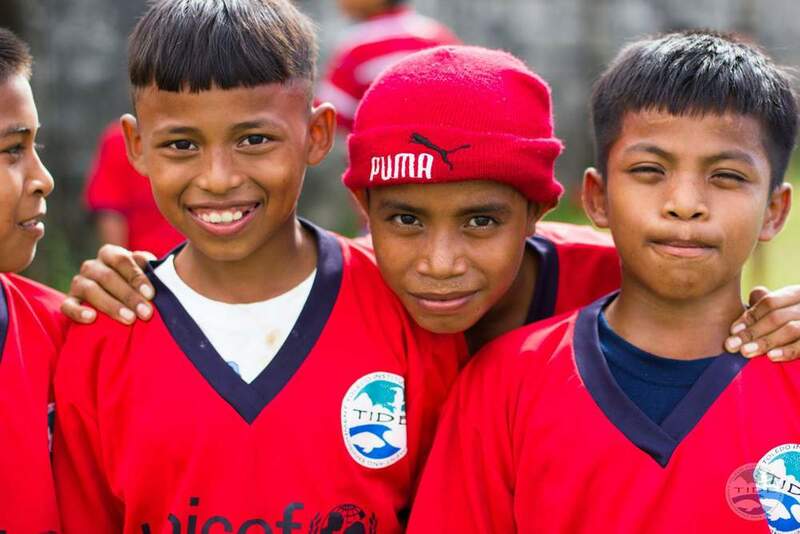 TIDE’s innovations have won international recognition through the UNDP Equator Prize (2002), CEPAL Award (2008) and the International Olympic Committee’s Award for Integrating Sport and Sustainable Development (2012). TIDE’s executive director, Mrs. Celia Mahung is an educator, community leader, champion for women’s rights, outstanding parent and conservation activist. She was born and raised in the Toledo District, where she resides today with her husband Paul and their three children, Karena, Giselle and Alwyn. Celia’s early career was in education. She earned bachelors and masters degrees in education from the University of North Florida before returning to Toledo to teach at primary, secondary and then tertiary levels. Throughout her teaching and leadership career, she has been respected for setting high expectations and obtaining outstanding results. 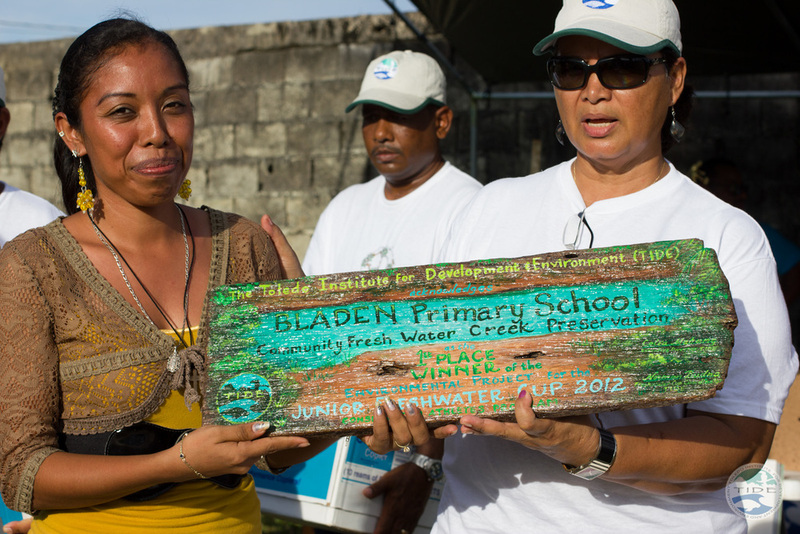 Celia Mahung (right) presents the Principal of Bladen Primary the award for 1st place environmental project 2012 for creek restoration. TIDE’s executive director, is an educator, community leader, champion for women’s rights, outstanding parent and conservation activist. She was born and raised in the Toledo District, where she resides today with her husband Paul and their three children, Karena, Giselle and Alwyn Mahung. And so in 1997, Mrs. Mahung seized the opportunity to become involved in founding TIDE, a grassroots organization that vowed to protect Toledo’s natural treasures and help local people earn a living sustainably. She volunteered on the Board of Directors for a total of six years before becoming executive director in January 2007. During her tenure, Celia has been responsible for a number of innovations that promote stewardship – programs such as the Freshwater Cup, Youth Conservation Competition, Community Researchers Program and Community Stewards Program, as well as increasing community participation in the governance of TIDE and the protected areas TIDE co-manages with the Government of Belize. Celia is proud to have built a competent and committed team at one of the leading conservation organizations in Belize and to have overseen this increase in community engagement. Her vision now is for TIDE to move beyond community involvement to community leadership, building the capacity of community institutions to take on increasing responsibility for the governance and management of natural resources, both within and outside of protected areas.